Heirloom tomatoes sell out early during the Farm & Garden's Spring Plant Sale. With backyard food production on the rise, organizers of the UCSC Farm & Garden's Spring Plant Sale have focused on food crops for home "victory gardens" along with an outstanding array of perennials for the garden and landscape. The Spring Plant Sale takes place Saturday, May 2, and Sunday, May 3, in the Barn Theater parking lot at the base of the UCSC campus, near the intersection of Bay and High streets in Santa Cruz. The sale will be open on Saturday from 10 a.m. to 3 p.m., and on Sunday from 10 a.m. to 2 p.m. On Saturday, members of the Friends of the Farm & Garden enjoy priority early entry starting at 9 a.m. (memberships available starting at 8:30). This year's sale will feature a great selection of tomatoes, peppers, eggplants, lettuce, salad mix, broccoli, cabbage, and other vegetables. Back this year are potato starts ready for planting, along with other high-nutrition crops as kale, chard, collards, and Asian greens. Rose enthusiasts will find a range of offerings, including the hybrid musks Buff Beauty, Will Scarlet, and Penelope, a number of English shrub roses, the floribundas Black Cherry, Bonica, French Lace, and Amiga Mia, and the popular Madame Alfred Carriere and Cecile Brunner. Among the annual vegetables this year will be an array of both sweet and hot peppers, Italian and Asian eggplants, and heirloom tomatoes, such as Aunt Ruby's German Green and Brandywine (both red and yellow) , along with Green Zebra, Rainbow's End, and Stupice. 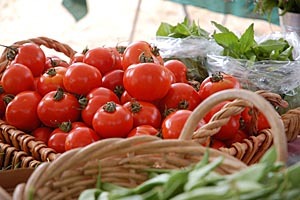 Cherry tomatoes will include favorites like Sungold, Camp Joy, and combo packs of red and yellow pears. In addition, basil, cucumbers, summer and winter squashes, and pumpkins will also be ready to find a happy home in your garden. Along with a wide range of perennial lavenders, salvias, and California natives, there will be numerous annual flowers. Thanks to a generous donation of seeds from Renee's Garden, there will be some stunning varieties of both smaller ornamental and huge seed-producing sunflowers, including Autumn Beauty, Bright Bandolier, Chocolate Cherry, Cinnamon Sun, and Snack Seed. Also available: snapdragons, zinnias, bachelor buttons (cornflowers), hollyhocks, stock, and foxgloves, including Foxy, a first-year bloomer. The Spring Plant Sale benefits the UCSC Farm & Garden Apprenticeship, a six-month training course in organic farming and gardening. Members of the Friends of the UCSC Farm & Garden receive a 10 percent discount on purchases; memberships will be available at the sale beginning at 8:30 a.m. on Saturday and 10 a.m. on Sunday. For more information about the Spring Plant Sale or the Friends of the Farm & Garden, call (831) 459-3240 or send email to jonitann@ucsc.edu.